A Pakistan test series is never complete without a post on Younis Khan. Younis has been an instrumental figure in test matches for Pakistan and with every series he stamps his authority and grows in stature as one of the best batsman to ever play the game. Like Michael Clarke, everyone is caught surprised when they hear that Younis Khan has played only 92 tests in his 14 year career thus far. There are so many batsmen all around the world who began their careers well after Younis and have gone past a 100 tests; Clarke himself, Alastair Cook, and Kevin Pietersen to name a few. I have always wondered where Younis would have been had Pakistan played as much test cricket as Australia, England or India. His figures in test cricket are comparable to those of the modern day greats, and just because Pakistan does not play as much test cricket, his runs tally is far behind. However, that alone cannot take anything away from the phenomenal batsman that Younis Khan is. He stands far above his Pakistani compatriots, as well as, his international peers. Prior to this test series against Australia in the UAE, Younis Khan was a distraught man. Having been dropped from the ODI squad (and rightly so), Younis spoke out against the PCB, declared himself unavailable from all cricket, and challenged the board to build a team without him. That could have very easily ended his career. Thank God for some sane heads in the PCB, sense prevailed, Younis was cajoled and talked to, and the man decided that he will play. Not only will he play, but he will play with the aim to become the first Pakistani to score a century against all other 9 test playing nations, to overtake Inzamam Ul Haq as the leading centurion for Pakistan, to overtake Javed Miandad as the leading run scorer in tests for Pakistan, and to become the first Pakistani batsman to reach the 10,000 run landmark in test cricket. He made his aims public prior to the test series against Australia and how he has appeared as a man on a mission. In the first innings of the series he achieved the feat of becoming the first Pakistani to score a century against all other 9 test playing nations, and in the second, he surpassed Inzamam Ul Haq's Pakistan record of 25 centuries. Not only did Younis Khan achieve those two feats, he also became the first Pakistani to score two centuries in a test against Australia and the first batsman in the world to achieve the feat of twin centuries against Australia in the past 40 years! I don't think I have the words that will do justice to Younis Khan's greatness, so I will just let his numbers speak for themselves. The most significant aspect of Younis Khan's 26 test centuries is that he has achieved the feat in far fewer innings than Inzamam Ul Haq and Javed Miandad. You can be sure that he will reach the 10,000 run mark if he ends his career with as many tests as Inzamam or Miandad. Younis surpassed Mohammad Yousuf's tally in the previous test series against Sri Lanka, and is currently third on the list behind Inzamam and Miandad. He needs a 1,000 odd runs to become the highest run scorer for Pakistan, which in his current form should take him another 8-10 test matches or so. Prior to this test series against Australia, there were 11 batsmen in this world who had scored a century against all 9 test playing nations. None of those 11 batsmen were from Pakistan. While Inzamam and Yousuf had missed out on the elusive club due to not being able to hit a ton against South Africa, Younis was missing out due to his failure to convert fifties against Australia. All that changed on the first day of the series as Younis Khan marched his way to 106 and became the first Pakistani and 12th batsman in the world to score centuries against all 9 test playing nations. That is some esteemed company that Younis is a part of now. A club that comprises of Sachin Tendulkar, Ricky Ponting, Jacques Kallis, Brian Lara, Steve Waugh, Kumar Sangakkara, Mahela Jayawardene, Adam Gilchrist, Marvan Atapattu, Rahul Dravid, and Gary Kirsten. 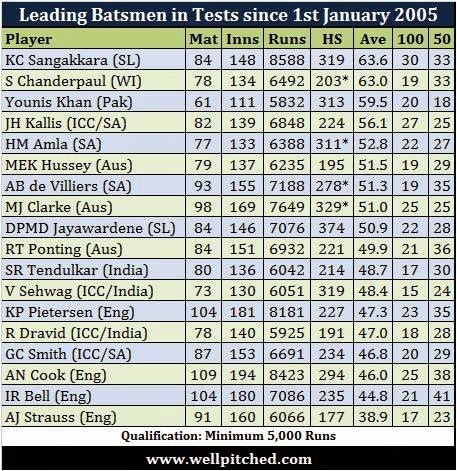 In the past decade, since January 2005, Younis Khan has the third highest average in tests, behind only Kumar Sangakkara and Shivnarine Chanderpaul. During this decade, Younis has performed better than the Sachins, Pontings, and Kallises of the world. 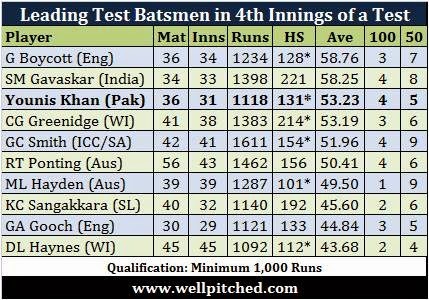 Younis Khan is among the only 6 batsmen in this world who can stake claim to averaging over 50 in the 4th innings of tests (min: 1,000 4th innings runs). He is also among the only 6 batsmen in this world who have scored 4 or more centuries in the 4th innings of tests. His average of 53.23 in 4th innings of tests is the 3rd highest in the world among batsmen who have scored at least 1,000 4th innings runs in test matches. 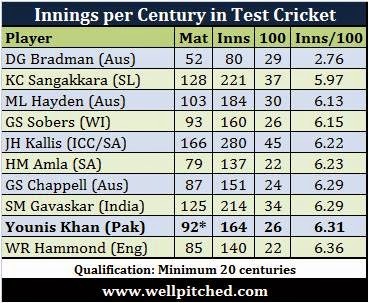 Younis Khan converts 48% of all his fifties into centuries in test cricket. That is a better conversion rate than the likes of Kallis (44%), Sachin (42%), Ponting (40%), Lara (41.5%), Dravid (36%), and many other batsmen who have scored at least 20 test centuries. It goes without saying that he has the best conversion rates among all Pakistani batsmen to ever play the game. 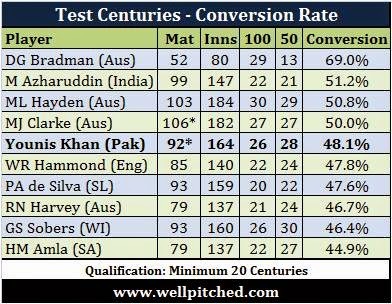 Only 4 batsmen have a better conversion rate than Younis Khan in test cricket. Younis Khan scores a test century every 6.31 innings. That is the bets ratio for a Pakistani batsman and it is among the best 10 innings per test century ratios in the history of test cricket. It is better than that of Sachin (6.45), Lara (6.82), Ponting (7.00), and Dravid (7.94), to name a few of his international peers who top the run scoring charts in test matches. Sachin, Ponting, Kallis, Dravid, and Sangakkara are the leading 5 run scorers in the history of test cricket. All of them have played over 160 tests in their career, besides Sangakkara who has played 128. Comparing Younis Khan to these 5 batsmen at the stage that Younis is right now, i.e. 92 test matches, shows that Younis has the third highest runs tally, a bit behind Rahul Dravid and well behind King Sanga. It is quite impossible to see Younis play as many tests as Ponting, Dravid, and Kallis did, however one can only imagine where Younis would have ranked among the leading test run scorers if only Pakistan played as much test cricket as some of the other nations. The hallmark of any great test batsman is how well he does in matches played away from home, in alien conditions that require adjustments and mental toughness. Younis Khan has the most runs by a Pakistani batsman and the 4th most runs by any batsman in the history of the game in test matches played away from home. Only Sachin, Dravid, and Kallis have scored more runs and more centuries in away test matches than Younis has. 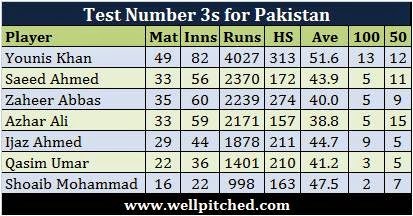 Younis Khan is by far the best number 3 batsman ever produced by Pakistan. He is well ahead in terms of runs, average, and centuries. Inzamam Ul Haq's prowess as a test match winner for Pakistan is well documented. No one has scored more runs (4,690) or more centuries (17) than Inzamam has in test wins for Pakistan. Younis Khan is second on that list for Pakistan with 3,347 runs and 12 centuries in test wins. It will take Younis some time to surpass this record of Inzamam, however there is another Inzamam record that Younis surpassed in this massive test win over Australia. Younis Khan's twin centuries in the test match took him past Inzamam as Pakistan's leading run scorer in test match wins away from home. 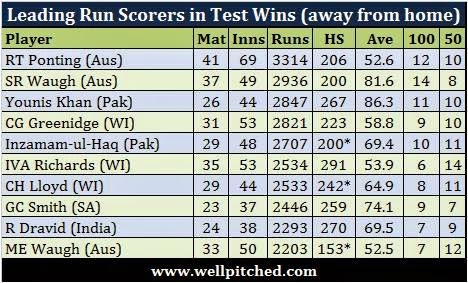 Not only is Younis the leading run scorer for Pakistan in test wins away from home, he is now only behind the Aussie pair of Steve Waugh and Ricky Ponting as the leading run scorer in test wins away from home in the history of the game. Both those run tallies are within Younis' sights and he could well end his career as the leading run scorer in test wins away from home. 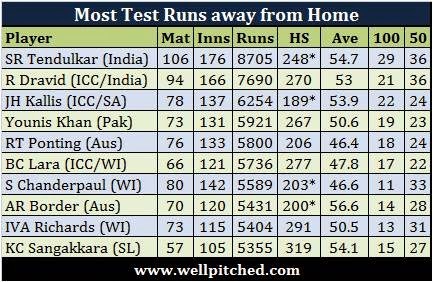 Younis Khan's average of 86.3 in test wins away from home is the highest average in the world among all batsmen who have scored at least 2,000 runs in test wins away from home. And among all batsmen with at least 1,000 runs in test wins away from home, Younis' 86.3 is only behind Alastair Cook (99.7), Sir Don Bradman (96.8), and Wally Hammond (95.6). Younis is also third on the list of batsmen with most 100s in test wins away from home. His 11 centuries, including the two in the just concluded match, is only behind Ponting's 12 and Waugh's 14. As I said, words cannot do justice to the stature of Younis Khan. He is not only the best test batsman produced by Pakistan, he is also one of their biggest match winners, and arguably the best test match batsman ever produced. Younis Khan was an absolute legend and a gem of a cricketer! the man with zero haters...Much love from india!